방콕, 태국의 더 오아시스 호스텔 | 호스텔월드에서 예약하세요. Located only a 5 minute walk from one of the wildest walking streets in Asia, the (in)famous Khao San Road, you’re always close to whatever your backpacker heart could ever desire.We are located in the Samsen area which is a constantly growing, colorful community full of funky restaurants/bars and, of course, cheap Thai street food that will treat your taste buds. 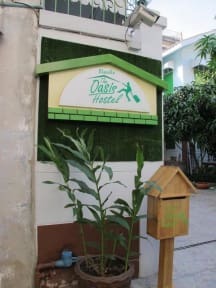 The Oasis Hostel is a relaxing place with great facilities in the common area where you can share your travel stories with other backpackers and our friendly staff, who are always happy to share tips and tricks to getting around Bangkok, where to find the best street food and to share their own travel experiences. We offer both private rooms and dorm rooms; all rooms are equipped with A/C! There’s FREE WIFI throughout the hostel. We have hot and cold showers with towels provided, and some of the most comfortable beds you will find in South East Asia, to get you rested for your next adventure. Our in-house travel gurus can answer any questions, regarding travel, you have and book any trips, tours, hostels and transportation that you might need. All of our western staff, Thai staff and Pow Wow, the hostel dog, will be here to help you get the most out of your time in Thailand and help you explore your way through the smells, tastes, sites, sounds and culture of this crazy (not so little) city we call home. 2). We do not allow outside guest's into the room, however they can access and join in at the bar area. Late checkouts will require a surcharge. 3). Weapons, explosives, dangerous objects as well as the consumption of drugs are not permitted. 4). Smoking is not permitted in any of the inside areas. 5). Late Arrival? Not a problem, we will always be available to help but please let us know beforehand. 6). 3 days advance notice for free cancellation. I stayed two night with my friends! Location is perfect to go khaosan and its also good for meeting new friends. BUT 만약 한국인이시라면 영어실력을 어느정도 가지고 있는게 좋습니다. 대부분 외국인들이기 때문에 함께 어울릴수는 있지만 영어 실력은 필수에요... 전 재미있게 놀았지만 영어를 잘 못하는 제친구들은 조금 당황스러웠나봐요,.ㅎㅎ 하지만 STAFF들은 슈퍼친절하고 외국인친구들과 함께 카오산에 놀러가기는 최고의 조건입니다!